It’s Big Energy Savings Month and what better way to reduce your energy bills then investing in a Smart Thermostat that will help you save energy and money on your fuel bills. To celebrate Big Energy Savings Month, we have teamed up with 50 Plus Magazine to give away an Alexa-compatible MiHome Smart Thermostat Pack (RRP: £129.99) to one lucky 50 Plus Magazine winner. Competition expires 31st January 2019 at 5pm. Terms and conditions apply. Winners will be emailed upon completion of the competition. Simply complete your details in the entry form below and hit 'enter'. Have you purchased Energenie products previously? Energenie will use your details to contact you about our products and services as well as discounts and offers, as detailed in our Privacy Notice. If you would prefer not to be contacted in this way, please tick the relevant boxes below. The Alexa-compatible MiHome Smart Thermostat is part of MiHome’s bestselling range of smart heating products. Easy-to-install and battery-powered, it connects to the boiler with a simple 2-wire connection. 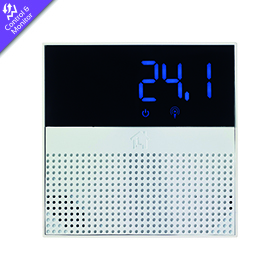 You can use a range of smart features to control your thermostat including setting timers for your heating to come on/off automatically, built in motion and humidity sensors enabling your heating to come on when it senses movement and geofencing allowing you to manage your heating to automatically come on when you are a certain distance from home. It can be controlled manually or via the MiHome app on your phone or via the desktop version. MiHome is a leading UK-based smart home brand which offers fully integrated home automation to monitor and manage lighting, heating, power and security in the smart home market. Compatible with Amazon Alexa, Google Home and IFTTT; MiHome products can be controlled manually, via the app or by voice with use of a smart speaker.